The pack donkey plodded through the animal forest. He never was one of the swiftest but right now, he seemed slower than ever. 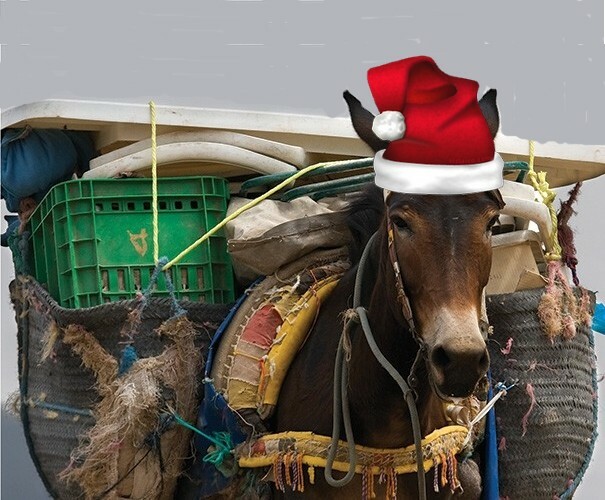 Each year, when the dark days of winter were upon them, the pack donkey disguised himself. He wore a red suit, trimmed with white fur, a buckled black belt and he even put a matching hat on his head. To be really unrecognisable, he also attached a long, white beard. * The young animals always eagerly awaited his arrival, because he was heavily loaded with packages for all tastes. However, legend also had it, that he took naughty animals away with him to a far and barren place. So they were at the same time happy, but also a bit scared. “What do you want from the gift bearer this year?”, the little lamb asked the piglet. “Marzipan of course”, said the piglet,** and sang a jolly song for the gift bearer to get in his good books. ***Some animals sighed deeply when the gift bearer came into sight again. Unlike the young animals, they knew very well it was up to them to provide the pack donkey with all the packages. You can read the explanations in the endnotes in the book.